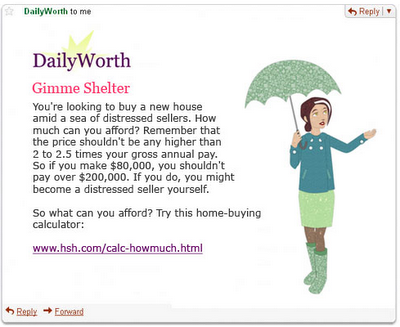 DailyWorth wants to change the way women view money. Their goal is to "deliver practical tips, empowering ideas and the occasional kick in the pants" via their daily email, community, and blog. In 2009 in the U.S., Women still make only $0.70 for every dollar earned by men. See the report. Nearly two-thirds of working women earn less than $30,000 per year. Women retire with on average 1/3 less in savings than men, yet live longer. The site covers topics from Capital Gains Tax to responsible shopping. Additionally, DailyWorth provides positive affirmations, networking advice, and tips for negotiating wages. Hi, I like how you're writing. I'd like to quote you if I may; a link back will, of course, be provided. Can I do this, please?